You know how kids can watch the same TV show, over and over again? How when you were a kid you could read the same book, over and over again? When I was a kid, I think that I must have read “Swiss Family Robinson” five or six times. A bunch of other sci fi and other titles as well. As an adult, there is only one book that I have read over and over again, every few years. 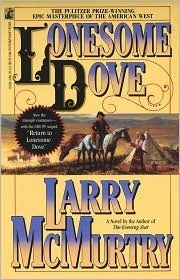 “Lonesome Dove,” by Larry McMurtry. Lonesome Dove is a gripping story, with characters so real that you feel that you are maybe sitting at the same table eating beans and playing cards with them, falling in love with the same girl, and the sweat rolling off your brow as you sit in the saddle beside them ready to hang a damn horse thief. It’s a western, for sure, and there are not a lot of people reading westerns these days, for whatever reasons. I’d like to say that the same story is such a great story that it could have been recast into other genres with a little work, but that is simply not true. This great story could only have been told in the context of America’s westward expansion, which is one of the most fascinating and controversial periods of all time. Recognize it or not, conflicts of that time permeate and structure our contemporary world. But I’m overanalyzing. If you haven’t read this book, pick it up. If you have, you know you would like to read it again. If there was one book of fiction that I could place in the hands of every leader of the nations of the world–friend and foe– and suggest that they could learn about the heart and soul of America from that one book, the book I would choose would be Lonesome Dove. And if those leaders read it, and understood it, the world would be a better, and more peaceful, place. And we’d have fewer damn horse thieves.